These contributions, of course, include work on social choice theory (Arrow’s Impossibility Theorem), general equilibrium theory, and innovation, and off the top of my head I can point to work on health care, organizational theory, quasi-option values, and a bunch of other stuff. Truly remarkable. Here is the New York Times obituary. Meanwhile, the profession has also recently lost Thomas Schelling (2016), Douglass North (2015), John Nash (2015), Gary Becker (2014), Ronald Coase (2013), and Elinor Ostrom (2012). You could learn a lot in a little while just reading the obits on these Nobel Prize winners. I had coffee with Tim Dahlstrom ’16 a couple of days ago, which is not very unexpected, except that we had it in a cafe with a view on the Kremlin. I am here visiting family, and he is here practicing his Russian and prepping for the GRE. 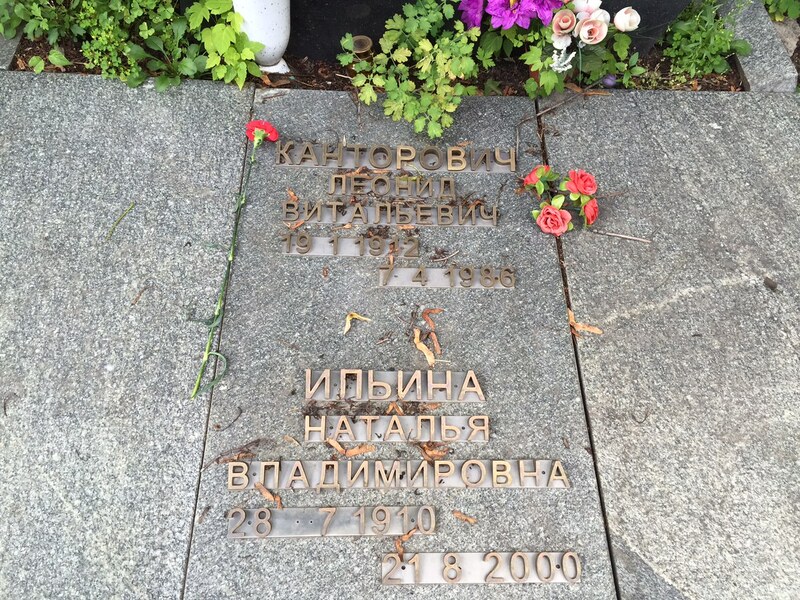 He shared with me afterwards this photo, which he recently took here in Moscow: It is the grave of a Nobel prize-winning mathematical economist, obviously from Russia. This should probably be enough for you to guess the name, but if you need more, here is a cogent Austrian perspective on his prize. Tim remembered him from the Red Plenty reading group from his freshman year. Wow, if you had to pick three topics of interest at Lawrence economics, you could do worse than Schumpeterian growth theory, entrepreneurism, and economic sociology. For my pick, I would probably take Daron Acemoglu if he wasn’t so young. Last year I picked Philippe Aghion, so maybe I should just go ahead and pick him again this year? Professor Galambos is going with Paul Milgrom and/or Jean Tirole. UPDATE: Tyler Cowen goes with William Baumol and William Bowen for their work on the venerable cost disease. Send me your picks or put them in the comments. Must be 18 or older to enter, void where prohibited. The Nobel Prize in Economics goes to Eugene Fama, Robert Shillier, and Lars Peter Hansen for their work on asset pricing. Fama is well-known for his empirical work on the Efficient Market Hypothesis, as well as work corporate finance (or any organizational finance, really). 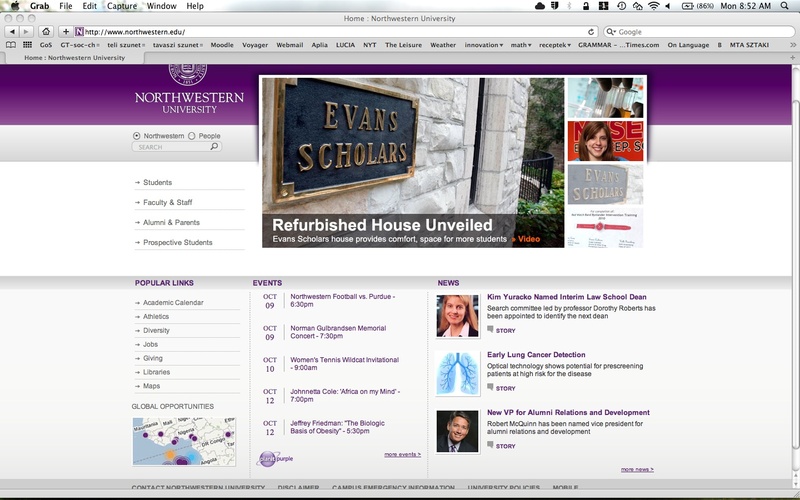 He has a half dozen articles with north of 10,000 citations. Zoinks. Shiller is a well-known behavioral guy who writes about market volatility and asset bubbles (are those inconsistent with the EMH?). You might know him from the Case-Shiller housing price index we’re always reading about. I don’t know much about Hansen, beyond the generalized method of moments business. 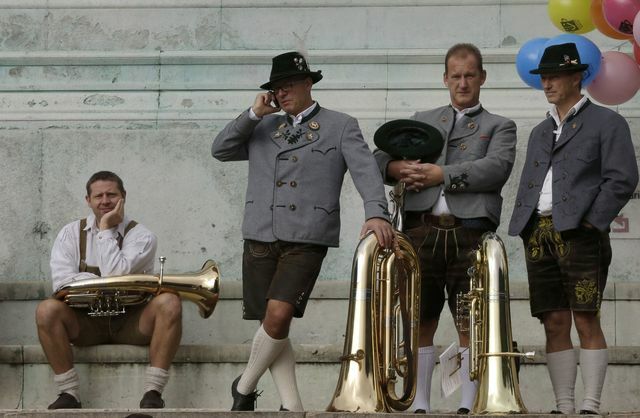 I’m sure there’s no dearth of news reports on these guys. Marginal Revolution has a thousand words on each today. Once again, there was no winner in the Pick the Nobel contest, meaning the fabulous prize package will roll over to next year. Posted on October 14, 2013 October 14, 2013 Author David GerardCategories General InterestTags Nobel Prize in Economics, Viva Marginal Revolution, We have a winner! If the award is for work on financial crises, banks, liquidity and regulation,Douglas Diamond of the University of Chicago Booth School of Business andPhilip Dybvig, of the Olin School of Business at Washington University, St. Louis, are headliners. In 1983, the pair wrote a seminal paper spelling out why bank runs happen. The authors explained that deposit insurance could reassure customers and keep them from panicking and pulling their money out en masse. Who knows? I seriously doubt Peltzman and Posner would get it, though now that Posner has backed off some of his more severe positions, perhaps he’ll get a look. Peltzman has been a very influential empirical economist, so it is conceivable that he would wind up in that first group. Daron Acemoglu seems a bit young, though he is a clear future favorite, so I will go with the indomitable Philippe Aghion. The Nobels go to Alvin Roth and Lloyd Shapley for their work on matching and/or market design; that is, markets without prices. Professor Galambos was talking about Roth’s work in our community read this last week, and Alex Tabarrok has a lot more here. Here’s an accessible piece on matching kids to schools. Here’s the famous Gale-Shapley piece on college admissions and marriage. In a related note, I often use Roth’s JEP excellent repugnance piece in my public policy classes. Here’s Al Roth’s excellent blog. A complement, not a substitute, we hope. Well, no winners in our guess the Nobel contest, so the prizes will be rolled over into next year’s contest. UPDATE: Professor Gerard picks Paul Romer, Professor Finkler picks Romer and William Baumol (both at Stern! ), Professor Galambos still undecided, see comments for additional picks. The 2012 Nobel Prize in Economic Sciences will be announced on Monday 15 October, and once again all the world is riveted in anticipation. The riveted parties include those residing on Briggs 2nd, where we will once again sponsor a Predict the Nobel Prize Contest, with the winner to take home some fabulous prizes. I don’t see any formal odds online yet, but Thomson Reuters provides some thoughts on Steven Ross for arbitrage pricing theory, Robert Schiller for work on market volatility, and Anthony Atkinson & Angus Deaton for the famous Atkinson & Deaton work on income, consumption, and well-being. So, submit your pick to Prof Gerard prior to October 15, keeping in mind that the Nobel winner will not necessarily come from that draw (Of course, I’m still partial to Armen Alchian, and I have to believe Jerry Hausman will win sooner or later). You can also post them in the comments, first come, first serve. Robert J. Shiller 2003. “From Efficient Markets Theory to Behavioral Finance,” Journal of Economic Perspectives, 17(1): 83–104. Stephen A. Ross, 2004 “Review of The New Financial Order by Shiller,” Journal of Economic Literature, 42(4): 1098–1101. Angus Deaton 2008. “Income, Health, and Well-Being around the World: Evidence from the Gallup World Poll,” Journal of Economic Perspectives, 22(2): 53–72. 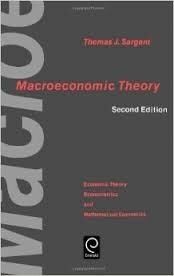 In what I’d have to say is a surprise, Peter Diamond, Dale Mortensen, and Christopher Pissarides picked up this year’s Nobel in economics for their work on search theory in labor markets. That means, for the second year in a row, the Lawrence University prize for picking the winner will roll over to the next year. I was chatting with Professor LaRocque on Saturday, and he felt that we were due for some theorists, so here you go. Some wagering odds have arrived on the scene. UPDATE: And here. Looks like my picks of Thaler and Shiller are leading the way, followed by Weitzman, Hart, Nordhaus, and Tirole. This time of year, there are typically grumblings about the lack of sufficient talent to justify a yearly Nobel in economics, but that is certainly an impressive list. Weitzman wrote a paper 30 years ago that still defines the core idea of environmental economics. No one has done more on the empirical cost-benefit modeling of climate change than Nordhaus. Tirole is a co-author of a standard graduate industrial organization text, as well as several highly-influential pieces on the economics of innovation. This title alone should merit consideration for Tirole — “The Fat Cat Effect, the Puppy-Dog Ploy, and the Lean and Hungry Look.” Is there a more effective title to help teach strategic behavior? Oliver Hart helped to push agency theory forward, developed a formal theory of the firm that is still being hashed out (in Economics 450 among other places), and probably has substantially expanded our understanding of corporate governance. It’s probably worth noting that last year’s odds-on favorite, Eugene Fama, is not even among the leaders (UPDATE: The Ladbrokes odds have him 5:1). Not to mention Armen Alchian. No, I don’t think there is an absence of talent. Of course, I’ll write about Shiller and Thaler next week after they win the prize. UPDATE: Professor LaRocque has predicted Jeffrey Williamson. The picks are pouring in for our Second Annual Pick the Economics Nobel Prize contest (see here). The consensus pick around the department seems to be Paul Romer, so we might be dividing up that bag of M&Ms pretty thin if he wins. Richard Thaler joint with Robert Schiller. Three prominent econometricians of your choice, bundled. Jean Tirole, possibly bundled with Oliver Hart and other game theorists/principle agent theorists. But last year the prize was in a similar field so the chances here have gone down for the time being. Doug Diamond, bundled with another theorist or two of financial intermediation, such as John Geanakopolos. Bernanke probably has to wait, although that may militate against the entire idea of such a prize right now. Dale Jorgenson plus ???? (Baumol?) for a productivity prize. Thaler was my original (anomalous?) pick, though yesterday I hedged and went with Shiller. So this might be a case of great minds thinking alike, or of me being brainwashed by reading Marginal Revolution too often. I like the Marty Weitzman pick better. Economics hasn’t given a prize for global climate change or for environmental work in general, and Weitzman has been a big deal forever for his canonical “prices versus quantities” paper, as well as for some more recent work on the “fat tail.” I’m not so sure about Nordhaus paired with him, however. Professor Finkler has Paul Romer. I have yet to hear from my other colleagues, who are no doubt strategically plotting their picks as I type here. As Professor Finkler points out, the Nobel Prize in economics will be awarded on October 11. That must mean that it’s time for the Second Annual LU Pick the Nobel contest. So, who should you pick? Well, one strategy is to check out the Thomson Reuters picks from Science (Alesini, Kiyotaki, Moore, Murphy). If you don’t like any of those to win, you might peruse the “Vegas” odds and see who you like there. As of me typing this, these odds do not appear to be out yet, but keep an eye out here and check here are last year’s odds. The same favorites from last year are obviously in play for this year — Eugene Fama for his efficient markets and Paul Romer for endogenous growth theory, Aplia, and charter cities. Another good choice might be Emmanuel Saez, who is fresh off winning a MacArthur “Genius” Grant. As a dark horse, you might pick the prolific blogging superstar, Tyler Cowen, for his work on the economics of culture. 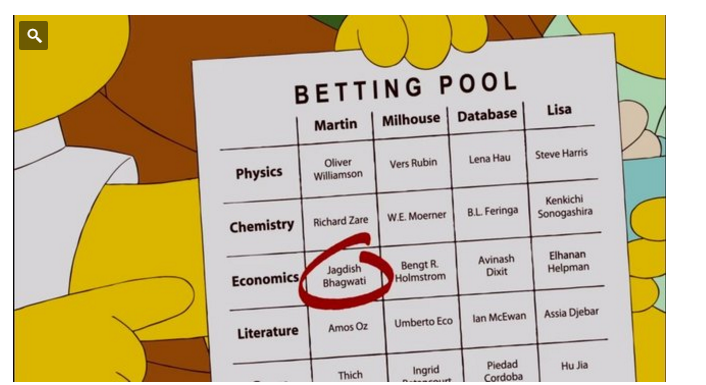 Or, you can always defer to The Simpsons for your pick (Bhagwati). A sentimental favorite, at least for me, is Armen Alchian. Don Boudreux points us to this essay and says that in a just world he would have already won the prize. My pick, which I forgot to pick in the original post, is Richard Thaler. I just hope that pick doesn’t somehow curse me. To enter the contest, submit a pick in the comments or via email to me. One entry per person, need not be present in Sweden to win. This year’s winner will take home an authentic piece of Schumptoberfest merchandise. Ties will be decided by Random.org at the Economics Tea. The Nobel Prize in economics will be awarded next week, and this kicks off the Official Lawrence University Pick the Economics Nobel Winner competition. * You should e-mail your picks to me. One entry per person. So you might be asking yourself who is even in the running. Well, you can find the latest odds here. At this point, you might be saying to yourself, “hold the phone, you can bet on stuff like that?” Indeed, you can bet on just about anything now, though in the polite academic ease we call these “prediction markets.” There is very much a burgeoning field of study here, and these markets generally do a better job than polls or pundits at forecasting the future. One point that I find particularly interesting is that these tend to work pretty well even if people are just playing for fun and not real money. Outside of the wagering angle, it might be interesting to take a look up and down that list and see who you recognize and why. Most of these guys have advanced the field in some way, and understanding their contributions might help you to understand different areas of economics exploration. The odds-on favorite, Eugene Fama, is the man behind the “efficient markets hypothesis,” which arouses passions of all sorts. Can you beat the market? Do prices really convey useful information? What exactly is an “efficient market.” The irony here is that if you believe in efficient markets, you should go ahead and enter Fama in the contest. Second on the list is Paul Romer, who is a pioneer of endogenous growth theory and the hero of the excellent Knowledge and the Growth of Nations, but he might be better-known to you as the guy who developed Aplia. There are many others that have made their mark on my thinking. If you take an environmental course, you will learn about Marty Weitzman (prices v. quantities) and Bill Nordhaus (climate change). Paul Milgrom and Oliver Williamson are both central figures in the theory of the firm. The list goes on. So, email your picks to me. The prize will be awarded at the next Economics Club meeting. *First prize will be a large sack of pears. Multiple winners will be sorted out by who chose the candidate first. My pick is Ben Bernanke, but I would be happy to cede my pears to anyone else who selects the Fed chair.